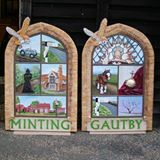 If you wish to purchase a copy of our village book, ‘Glimpses and Gleanings from Minting and Gautby’, this book is currently out of print. There are a few copies still on sale at Minting Park Farm email info@mintingparkfarm.co.uk Please do email us to let us know of your interest as we may consider reproducing on demand. We are also planning on producing a Volume 2. Please email mintinggautbyheritagesociety@gmail.com with your details and queries.